It’s been nearly a week now, but it still doesn’t quite feel real. 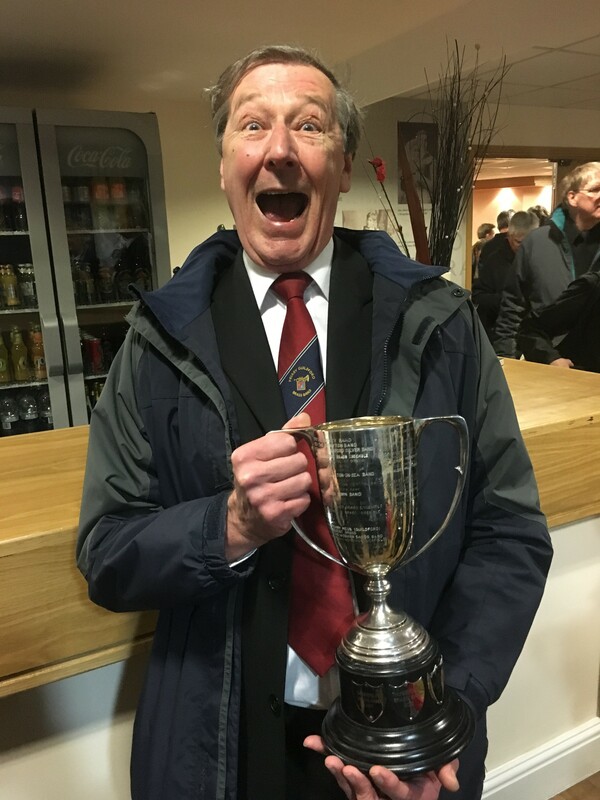 On Sunday 18 March LGB Brass travelled to Stevenage to take part in the London and Southern Counties regional contest of the National Brass Band Championships. The pilgrimage to Hertfordshire is an annual one for the band, and 2018 would be the fifth year in the second section. 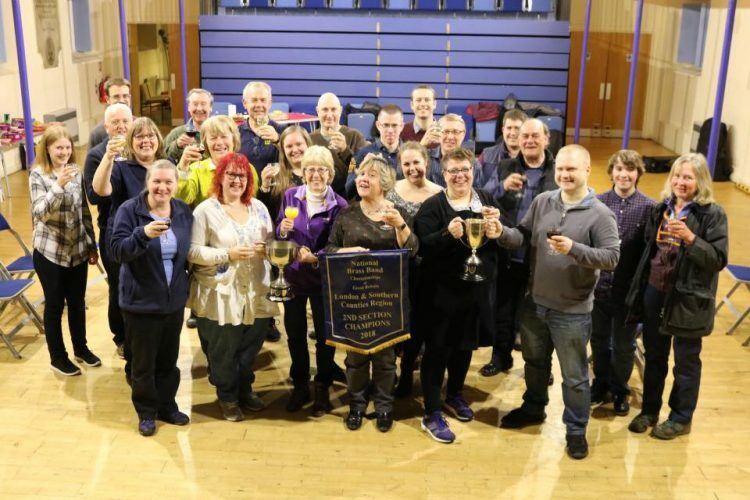 Having been promoted after winning the third section at the national finals in 2013, we had consolidated our second section status with some solid mid table performances, and were aiming for more of the same, with some tough competition expected in the section. The local weather had decided to throw a spanner in the works, and with snow predicted on Saturday night and into Sunday, there was a niggling worry for all that travel plans would be disrupted and we’d end up with half a band. Our worst fears didn’t materialise however, and by the time we assembled for rehearsal in a local hotel at 8:30, all members were safely present and correct. For anyone uninitiated in the slightly bizarre world of competitive brass banding, the adjudicators sit in the performance space (theatre, sports hall, etc) in a tent-like contraption, which looks faintly like the sort of den you’d build as a child with sofa cushions and bed sheets. This is to ensure that their assessment of the performance is based solely on the performance – and not the colour of the conductor’s socks, or the fact that the bass trombonist bought them a drink in the hotel bar last night. To further ensure neutrality, the performance sequence of the bands is determined on the day, after the adjudicators have gone into ‘the box’. The ‘draw’ is a bit like what you see on TV for the FA cup, except it’s taken much more seriously. A representative from each band pulls a ball out of a bag which denotes the playing position for their band – each representative trying to avoid pulling out the number one – since later playing slots are judged to be more favourable due to their closer proximity to the decision process. The draw representative for LGB on these sorts of occasions is usually secretary Jane Stewart. Jane is the band’s consummate organiser, knows the rules and processes of contesting inside out and backwards, and is, it’s fair to say (and in the best possible way), a bit of a control freak. On this occasion, so that she could attend our 8:30 rehearsal, Jane had delegated responsibility to former member of the band and general hanger-on Tom Elliott. Now at this point writing in anything other than the first person feels a bit weird. I knew that if I was late, or didn’t turn up at all, or messed something up with the draw, Jane would never delegate again. And that’s not good for anyone. I was so worried about the impending snow that I decided at the last minute to travel to Stevenage on the Saturday and booked into the not-very-glamourous Stevenage Ibis, literally a 2 minute walk from the Leisure Centre where the contest takes place. Jane had told me I needed to be there at 8:30. I woke up at 6. Not even kidding. I allowed extra time leaving the hotel, for the fact that one of the hotel lifts was out of order, and got to the draw room at 8:10. It was locked and deserted. I sat down to wait. Figuring that by about 8:20 there should be representatives from other bands coming along. At 8:28 I was still on my own, but someone had opened the door to the Control Room so I headed in. ‘Gosh, you’re early’ I was told. I thought he meant ‘because you’ve been sitting outside for 20 minutes’. No. It turned out that the draw wasn’t actually due to happen until 9am. Jane, being Jane, had provided an extra time cushion just to make sure I was there on time. Thanks Jane. Realising that ‘the hand of Stewart’ might be at work here, I sent a text to someone in the band who shall remain nameless. ‘I’m in the room waiting for the draw. On my own. I bet it’s not till 9 and Jane was just being Jane’. Received the reply – ‘Yes’. 2 minutes later at 8:38 – I asked the only other guy in the room – ‘what time is it meant to happen? I was told 8:30…’. Received the expected response. It’s 9. Sent another text message to the aforementioned band member: ‘Confirmed. It’s 9.’ (There may also have been a minor expletive to express frustration at the sleep I’d missed out on). Twenty minutes later the draw started, and after a bit of faffing about it was my turn. ‘Not number one…’ I said under my breath, thereby dooming myself to the inevitable. I looked at the tile in my hand. Number one. Knowing (because Jane had emphasised it strongly) that it was important to let everyone know we’d drawn the first slot, I texted Jane and the other band member (Jane has been known to inadvertently leave her phone on silent at critical moments). 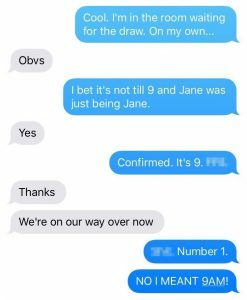 Once the draw had finished, I called Jane to make sure the message had got through. She sounded stressed. I apologised for my poor performance in the blind draw. ‘Is it 9 or 1?’ she asked – a definite note of tension in her voice. ‘Because (the band member who shall not be named) has had a message with 9 on it’. I was confused. ‘Not from me they haven’t’ I replied. For a moment all I could think of was that my phone had somehow been hacked by a competing band. Then I realised what absolute nonsense that was. And remembered, slowly, and painfully, the conversation I’d been having by text twenty minutes before the draw even started. And the last message I’d sent. ‘NO! I MEANT 9AM!’ was the only appropriate follow up. For a while I considered legging it and going home, and just never making contact with any of the band ever again. But Sussex isn’t that big, and it’s pretty difficult to hide in, so I knew the only option was to go and face the music. I went down to the pre-registration room, where some of the band were dressed and ready, and some of the band were desperately ringing around trying to get other members out of the nearest Wetherspoons. (Yes, at 9am on a Sunday. That’s brass bands for you). Jane seemed to have forgiven me, if only because she felt better knowing that I had texted her the draw result first, as requested, instead of leaving her out of the loop as she had assumed. Normal service will now resume. Having come fresh out of rehearsal, and not having had time to get anxious about the performance, the band went on stage feeling good and happy with the draw. The first band of the day has the responsibility for playing the national anthem. This can be both a blessing and a curse, on the one hand, no other band gets the opportunity to have a blow on stage to get their ear in before the real thing. On the other, if not played well, this sets a tone for the adjudicators which influences the perception of the rest of the performance. Ian Stewart, however, is no stranger to contesting. In anticipation of the possibility of playing first (having drawn this slot at the national finals in 2011), Ian had rehearsed this familiar tune with the band the previous Thursday. They nailed it. The test piece performance (Jonathan Bates’ Ex Terra Lucem) was not perceived by the second section bands to be particularly technically stretching. The challenge with these pieces is therefore to avoid complacency. Bands must get the basics absolutely right – as there’s nowhere to hide questionable tuning or poor ensemble. The audience reaction to Ian’s interpretation as demonstrated by the band on Sunday was enthusiastic, and everyone came off stage feeling happy. The band’s mood usually a reflection of Ian’s face at the end of the last few bars. The hard work over and done with the group dispersed – some heading home, others back to the nearest ‘Spoons. The nice thing about playing first is that the pressure’s off early – everyone can relax, get some food, stroll round the delights of Stevenage, or listen to other bands in the section while waiting for the outcome. We reconvened in the Gordon Craig Theatre at about 4pm to hear the results. As before, while the band felt they’d done themselves justice, there were no delusions of grandeur or lofty ambitions. The adjudicator’s remarks were flattering. Both they (Leigh Baker and Tom Davoren) and the composer (Jonathan Bates, who had been in attendance at several second section area contests through the previous few weeks) commented that the performance in the London and Southern Counties region had been among the very best in the section across the nation. The standard had been extremely high. The top four bands would be announced in reverse order, everyone else could find out their placing from the Control Room after the announcement. Fourth place went to Wantage Concert Brass. Third went to Milton Keynes Brass, and second to St Sebastian’s Wokingham. The special prizes were then announced. Another short pause. Brains processing. Really? From a number one draw? As the band started celebrating Ian was presented with Conductor’s prize, the cherry on the top of a day of firsts. Onward to the National Finals once again.